Celine Baekeland, Coconut Grove, Miami. Florida Coast, 1937, oil on canvas 24 1/2 by 29 inches. The Baekeland’s bought the Villa Serena, the William Jennings Bryan home in Coconut Grove, on Brickell Avenue, just a few blocks from Viscaya, renaming it The Anchorage. The Miami Herald, January 18, 1940, carried the following: “Celine Baekeland is well known as a painter, and Dr. Baekeland, whom Miami claims as one of its distinguished citizens, is very proud of her accomplishments. ‘She rarely sells a painting; she likes to give them away. But she is naturally proud of the prizes she has received,’ he declares, from the terrace of ‘The Anchorage,’ his bayfront home in Coconut Grove. In his study is a painting his wife did for him of a scene in Sleepy Hollow Cemetery in Westchester County, New York.” Celine Baekeland lived at the Anchorage, active in Florida art circles, until her death in 1957. The Baekelands are buried in Sleepy Hollow Cemetery. Died: February 27, 1957, Coconut Grove, Florida. Education: Kerchove Institute, Ghent, Belgium; with Hobart Nichols. 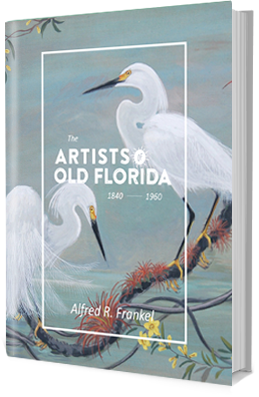 Membership: Blue Dome Fellowship; Florida Federation of Art; Southern States Art League; Society of The Four Arts; National Association of Woman Artists; Allied Artists of America; American Federation of Art; Palm Beach Art League. Exhibits: The Old Bridge of the Horse Bruges on cover of Literary Digest, August 1931; Blue Dome Fellowship, Annual Exhibition, Miami Beach Library and Art Center, January 1937; Florida Federation of Art, 11th Annual Exhibition, St. Augustine, December 2-5, 1937, Florida Jungle, Tropical Palm Hut; Florida Federation of Art, All Florida Show, Palm Beach, 1938, Tradewinds; Studio Guild of New York, Exhibition of Contemporary Paintings, New York City, January 1938; Albany Institutte of History and Art, Contemporary American Art Exhibit, February 1939; Florida Federation of Art, Annual Circuit, 1940, Christmas Trees as They Grow; Society of The Four Arts, 3rd Annual Members Exhibit, January 1941, Winter, Chrysanthemums; Blue Dome Fellowhip, Miami Beach Public Library, member of jury, January 1942; Housekeepers’ Club annual, Coconut Grove, February 1942; Society of The Four Arts, 4th Annual Members Exhibit, March 1942, Tropical Seeds; Miami Woman’s Club, February 1944; Palm Beach Art League, Norton Gallery, March 1944; Art Association of Newport, Rhode Island, July 1944; University of Northern Iowa, September 1944, One Woman Exhibit; Florida Federation of Art, Annual Circuit, 1944, Jacksonville, oil, Spring on the Farm; Society of The Four Arts, 7th Annual Members Show, January 1945; Blue Dome Fellowship, at Housekeeper’s Clubhouse, 2985 Bayshore Drive, January-February 1948.